Export is only available in Pro Version. 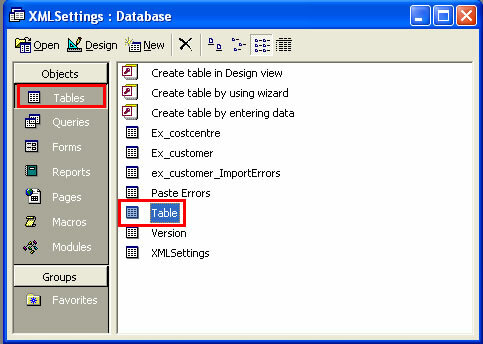 This page covers the tables which can be exported and the system settings which control the export process. 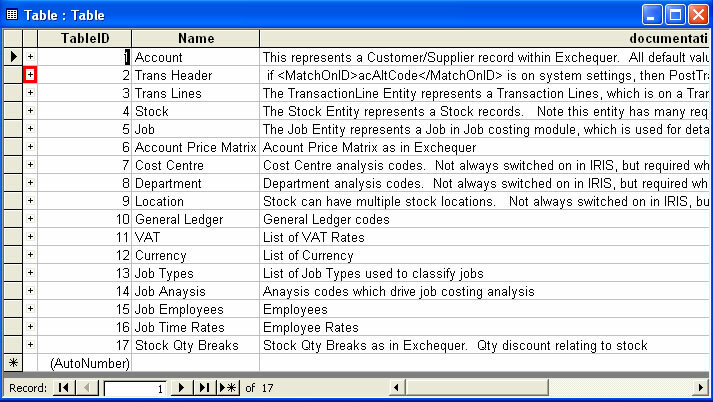 The exported data functionality allows an external system to display list of Exchequer data when entering a transaction. Or display outstanding Order or Invoice on a Web site. The Pro version of XML eGateway, in CSV format. This can then be uploaded into external/e-commerce system. The settings for the Pro version are held in XML eGatewaySettingsPro.xml, and also available from "View >> Settings" menu. The fields to export can be turned ON/OFF by ticking and unticking the "Export", in table record of file in XMLSettings.mdb. if acDiscountBand ="" then acDiscountBand="A"
Get	acDiscount. This can contain a % discount on everything unless??? Get stParent1-6 from the stock record. These represent the parent codes of stock item in Exchequer stock tree. † Exchequer has the ability to select effective dates for a price band, this should be checked also. The Customer/Supplier fields which can be exported are covered by the Import Account page. This lists the fields which can be imported, which with few exceptions can be exported, plus a list of special export fields at bottom of page. Stock code OR Stock Parent code of item to apply discount. Stock in Exchequer is organised in a tree structure, and stock discounts can be applied to any level of the stock tree, and thus applied to all siblings under that group in the tree. Stock is an optional module in Exchequer Enterprise. The fields which can be exported are covered by the Import Stock page. This lists the fields which can be imported, which with few exceptions can be exported, plus a list of special export fields at bottom of page. Exchequer Enterprise stock record has 8 price bands, label A-H (stPriceBandA_Price-stPriceBandH_Price). These are usually in currency 1, but can be in different currencies (stPriceBandA_Currency-stPriceBandH_Currency). Multiple locations can be enabled within Exchequer Enterprise. By default XML eGateway will export overall stock level, free to sell, and qty on order. If the installation has one or more main locations, and several sundry locations, then enter the locations to export a figure for in <stock_locations> list of settings. Table name:Outstanding_orders and Outstanding_order_lines. The two tables are related by thOurRef (in Outstanding_orders), and tlOurRef (in Outstanding_order_lines). The Outstanding_order_lines table should then be sorted by tlLineNumber to give correct order. Sales Order Processing is an optional module in Exchequer Enterprise. The fields which can be exported are covered by the Import Transaction page. This lists the fields which can be imported, which with few exceptions can be exported, plus a list of special export fields at bottom of page. Table name:Trans_since_x and Trans_since_x_lines. The two tables are related by thOurRef (in Trans_since_x), and tlOurRef (in Trans_since_x_lines). The Trans_since_x_lines table should then be sorted by tlLineNumber to give correct order. Table name:Outstanding_invoice and Outstanding_invoice_lines. The two tables are related by thOurRef (in Outstanding_invoice), and tlOurRef (in Outstanding_invoice_lines). 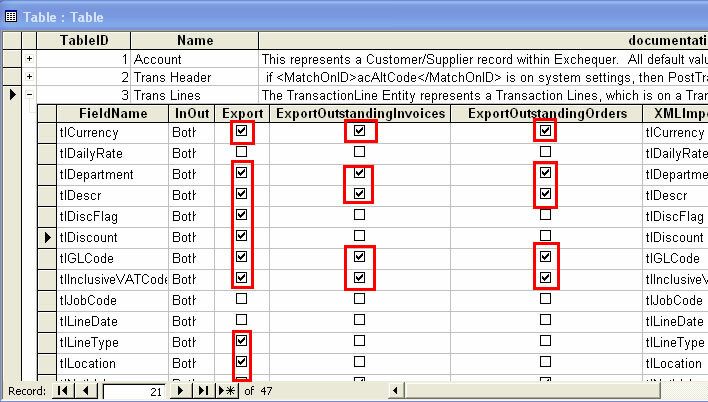 The Outstanding_invoice_lines table should then be sorted by tlLineNumber to give correct order. Cost Centre/Departments are used as an extra analysis in Exchequer. If turned On, within Exchequer, then they are on each transaction line. The XML eGateway will set the default value within a transaction when imported. The default value depends on how the Exchequer system is setup. This information is exported to allow the developer to display the list of Centre/Departments codes within their own app. The location record allows the address of the location to be entered. But usually just the ID and name is of importance. The general Ledger in Exchequer drives the financial analysis. Defaults for a stock item, or Job Analysis code, are usually set within Exchequer. Thus the GL Code is set automatically. If stock and job costing is not used then the GL code would need specifying on a transaction before importing. This information is exported to allow the developer to display the list of GL codes within their own app. Exchequer allows 20 VAT codes. This information is exported to allow the developer to display the list of currency codes within their own app. Job Costing is an optional module in Exchequer Enterprise. The fields which can be exported are covered by the Import Job page. This lists the fields which can be imported, which with few exceptions can be exported, plus a list of special export fields at bottom of page. Job Analysis codes drive the Job costing analysis. They set the GL codes when importing. This information is exported to allow the developer to display the list of Job Type codes within their own app.